Born in Lamontville, Durban, Zamani Makhanya experienced the trauma of losing his brothers one after the other to genetic heart-related conditions. 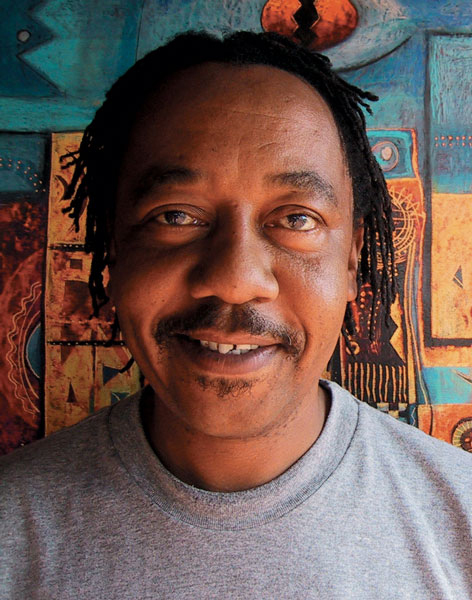 The youngest in his family, Makhanya enrolled at the University of Fort Hare in 1979 and graduated in 1985 with both an Honours Degree in Fine Arts and a Higher Diploma in Education. As a student Makhanya won several awards and his work found its way into public and private collections. He went on to teach art at Ntuzuma College of Education from 1986 to 1999. Makhanya found inspiration in images from newspapers and magazines and expressed the political turmoil of the 80s, a development that was far-removed from the small town of Alice where the University of Fort Hare is situated. Although Fort Hare was a highly-politicised academic institution, it was the ‘townships’ that actually took to the streets to protest against the apartheid government. Images of these events filled magazines like Drum. The period that Makhanya spent teaching produced little or no significant art work as all his energies were focused on his teaching career. In 1999, aged 40, his employment was threatened by the Government’s decision to phase out colleges of education. Many people lost their jobs or were diverted to other sectors. At this point it also became clear to Makhanya that he had lived way beyond his ‘expected’ time. The death of his brothers before the age of 30 convinced him that his turn was imminent, but at 40 he saw his life as having a new beginning. It was ‘a chance to live again’; an opportunity to rediscover his spirit and to use his talent and educational background to find his way back into the art world. His journey started at 37 Crart Avenue, an old house in Glenwood, Durban, with a rich but sad history. The property was the site of a former underground anti-apartheid publishing press; a parcel bomb had exploded there in 1990, killing a man as he opened the package. After this incident the house was turned into a commune for students and young professionals, a unique space within the city where creative black artists could engage and interact. It was here that the collective 3rd Eye Vision was born, and Makhanya was among the founders. Also involved were Sfiso Ka-Mkame (qv. ), Khwezi Gule, Gabi Ngcobo, Thando Mama, Langa Magwa, and the poet Bandile Gumbi, among others. At this point Makhanya and Ka-Mkame began collaborating. Makhanya was intrigued by the technique that Ka-Mkame was using and his aim was to master this to be able to communicate his ideas. A show held at 37 Crart Avenue entitled Masked/Unmasked announced Makhanya’s comeback. It featured works by other artists in the collective as well as musicians, performance artists and poets. The oil pastel technique that Ka-Mkame adopted is characterised by a layering of varying tones of colour that are superimposed to create a strikingly deep visual effect that alludes to a layering of histories, building up to the present. This technique became instrumental in the two artists revisiting issues dealing with the dynamics of a universal African life. Ka-Mkame applies a personal synthesis of traditional art forms and his own creation, and blends this with his understanding of the urban and traditional environment. At times he borrows from Eastern philosophies to create a synthesis of cultures that speak to each other. The work Power of the spirit world (plate 315) was featured in a travelling exhibition entitled Untold tales of magic: Abelumbi, held at the Durban Art Gallery in 2001. In this work Makhanya fused representation with an abstract approach, and focused on issues of spiritual survival and beliefs associated with different interpretations of tradition and culture. The work is comprised of seven panels, three on each side of a central panel dominated by a spiritual figure whose face is constructed from images of people who symbolise the past, present and future generations. Here the moon and the sun occupy a space where day and night coexist. And in its entirety the work captures African concepts of life and death, rituals, mystery, ancestry and destiny. The symbolic number ‘seven’ unifies these concepts to create a composition that tells a spiralling story that repeats itself, but always in a different form. Makhanya’s solo exhibition entitled The unfolding spirit held at the African Art Centre in Durban in 2003 was a sell-out. The artist demonstrated his understanding of the medium, which he then pushed further to articulate his own ideas. With this move, Makhanya was indeed reborn. Born Durban, 1959. Training 1984: BA Fine Arts (Honours), University of Fort Hare. 1985: Higher Diploma in Education, University of Fort Hare. Exhibitions 2003: The Unfolding Spirit, solo exhibition, African Art Centre, Durban. 2003: Thwasa 3rd Eye Vision Collaboration, NSA Gallery, Durban. 2005: Ibuya, solo exhibition, Maison De L’outre-Mer, Nantes, France. Collections Durban Art Gallery; Pretoria Art Museum; Department Of Arts and Culture; Greater Durban Authority; Development Bank of Southern Africa. Photograph of Romeo Zamani Makhanya. Courtesy of Anthea Martin, African Art Centre Archives, Durban.